ClinicAll has been dedicated to realizing computer-based information and communication solutions for clinics since 2008. The acclaimed ClinicAll bedside terminals provide safe access to the clinic information system, enabling doctors and staff to see, share and manage all patient data, while also answering the patients' entertainment needs – such as TV, Internet or phone. The importance of digital solutions is ever increasing: the annual data volume will grow by 50% until 2020 – a tenfold increase within just six years! ClinicAll collaborates closely with specialist hardware and software providers such as Microsoft, Advantec, SRC Infonet and NiQ Healthcare. 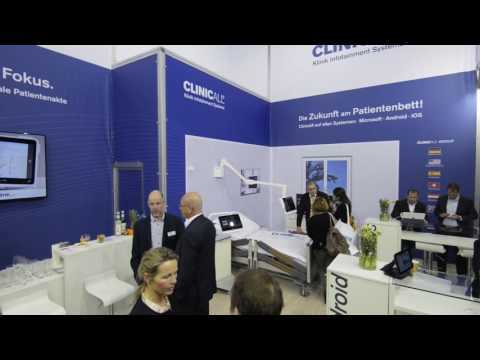 Digital patient data access, patient room supervision, food ordering and soft nurse call have been successfully implemented on ClinicAll bedside terminals, thus offering a true one-stop solution for the digitalization of clinic operations.